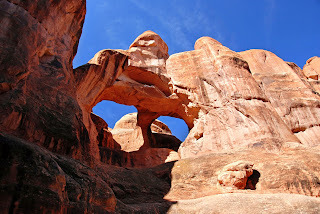 On are wonderful trip to Moab we spent a lot of time in Arches National Park. I would like to tell you about the difference between a natural arch and a natural bridge. Natural arches most often form when there is a narrow section of sandstone that is permeable that sits on top of shale which is impermeable. When water seeping through the sandstone meets the shale it is forced out forming springs. The water will begin to erode the shale and weaken the sandstone by dissolving its cement. 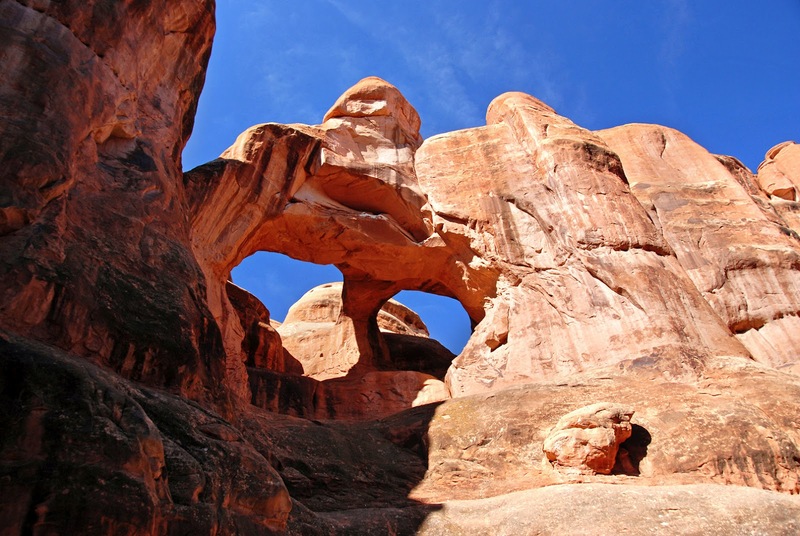 When this happens the sandstone begins to be undercut and rock fall will occur until a hole is formed creating an arch. The arch then grows upward through successive rock falls. Natural bridges form where a stream once ran. One type of natural bridge is created by potholes in a streambed. The stream may undercut the lip of a pothole to form a natural bridge much like in the photo of Skull Arch. This is called a pothole arch. Everyone should go on these field trips. You learn so much about the cool things the earth does and see some of the most amazing sites mother nature has to offer.